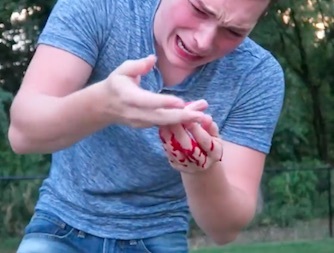 Predictably, a YouTube vlogger has pretty much sliced his finger off while trying to perform a sword stunt on camera. The gory clip shows Lance Stewart attempting to recreate a live version of the game Fruit Ninja by trying to cut through fruit being thrown to him with two swords, reports the Daily Star. At first it looks to be going okay as he successfully slices a couple of pieces of fruit before things go wrong. He swings, and his swords crossover with his little finger caught in the middle. Lance lets out a terrified scream as blood gushes from his hand and a woman can be heard panicking as she rushes to call an ambulance. Friends rush around him – but continue to film, of course – as blood pours from his hand. Lance begins to look pretty pale and then suddenly faints, falling to the ground. 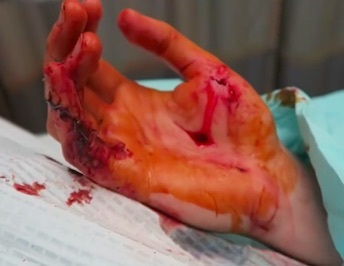 Once in hospital, he continued to record his injury, showing off the deep gash in his finger to the camera. Doctors patched Lance up with nine stitches but he later had to return to hospital for an operation after realising he had severed a tendon and had no feeling in his little finger.